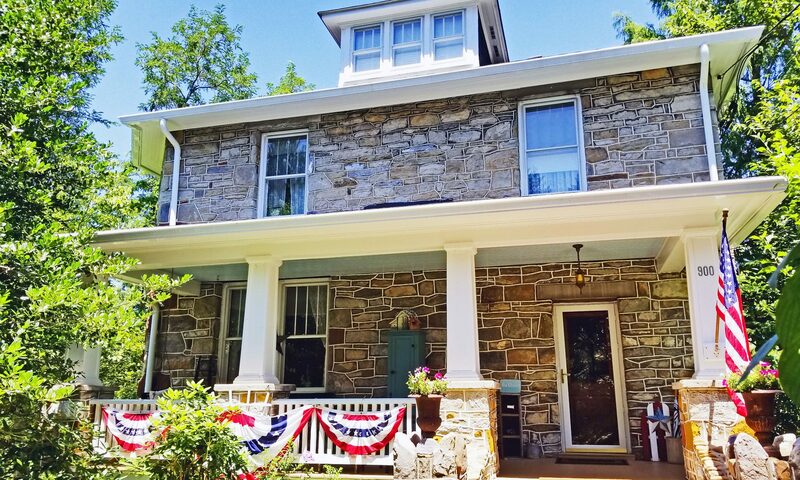 We are located on Fillmore Street in the upper town level of historic Harpers Ferry, a block west of the former Storer College, and have two spacious guest suites with kitchenettes for you to choose from. The Studebaker Suite is a rare Harpers Ferry luxury accommodation. 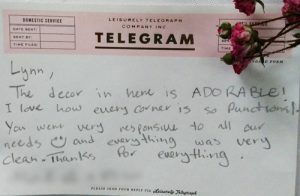 A newly renovated space, the suite’s decor is industrial/vintage — and maybe a touch bohemian — in the main living/sleeping/kitchen areas but more upscale-modern with a French-quarter flair in the spa-like bathroom. 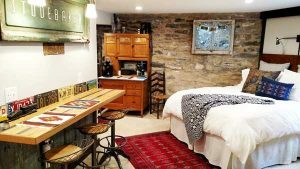 The living area includes a love seat (which converts to a twin bed) and ottoman facing a vintage woodstove that adds a romantic ambiance on chilly evenings. The 10×10-ft tiled private bathroom in the suite includes a 6-ft-long shower with both rainshower head and spray wand, a clawfoot tub, sink and enclosed toilet room. Turkish terrycloth robes and slippers are available for your use while you are enjoying your stay here. Next to your queen-size bed is a full-size window looking onto the gardens. Just outside the suite’s private entrance is a private deck with outdoor furniture dedicated for your use, so you can enjoy a sunny breakfast outdoors if you like. The full kitchenette includes a sink, mini-fridge/freezer, toaster oven, microwave, coffee bar, and blender. This space is ADA oriented, although it is not strictly ADA compliant. No steps are required between the parking area and the suite. See availability and rates below. See the full list of amenities at the bottom of the home page. This is a non-smoking property. Smoking is permitted outside the property fence only. The entire third floor is yours for total privacy in a cheery, light-filled comfortable suite. 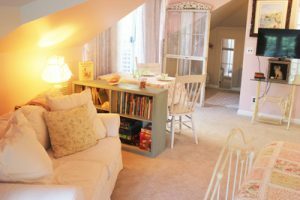 It includes a full private bathroom (in the suite), a queen bed, a living area with a plush love seat, window seats, a full kitchenette, table and chairs, books and games, and a private balcony with outdoor table and chairs overlooking a flower-filled garden. See the full list of amenities at the bottom of the home page. Note that this suite is can be accessed only by stairs, with entry through the main house front door. The suite is named Inez’s Sweet Retreat in honor of one of the original occupants of the home. Inez Johnson Saunders and her husband William were both graduates of Storer College and lifelong educators. Learn more about the Saunderses. Note that we accept government room rates. Please inquire if you are in the area on government business. Check availability and reserve your visit to Rockhaven B&B online through Airbnb. Phone 304-535-8235 or email info@rockhavenbnb.com. *Double occupancy (Additional guest: $10. No more than 3 guests total allowed). State and local taxes will be applied to your total. Rates subject to change. **A two-night minimum stay is required on weekends. We may be able to make an exception, especially if you are reserving within 1 week of your visit. Send an inquiry if you prefer to stay only 1 night, and we will see what we can do. 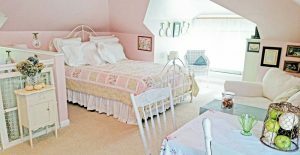 Neither suite is suitable for children ages 1-12 or pets (but we can recommend a good local petsitter!). Keep in mind that this is our home and is a 90-year-old house. While we are very careful about keeping quiet while guests are around, you may occasionally hear some of the noises of daily life from your room.